Their paper asks an interesting question, and apparently they are among the first to attempt an answer using empirical data. Suicide is one of the oldest topics of interest for social scientists, going back to Émile Durkheim's 1897 publication. The main problem with the paper's analysis is the use of observational data to make a causal claim. 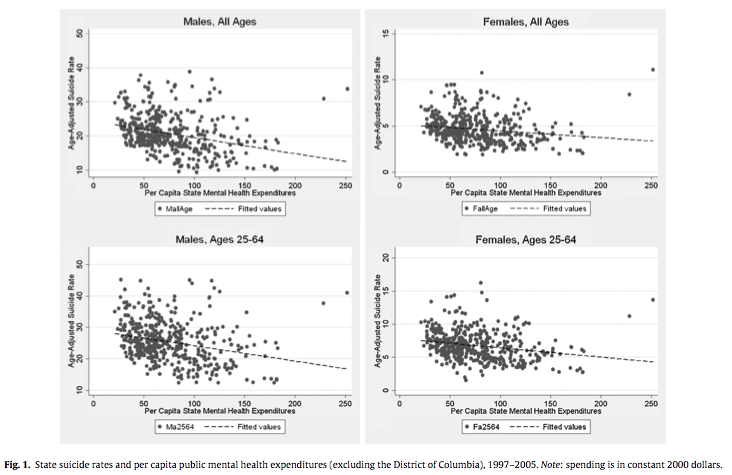 * As the authors themselves point out, state mental health spending is remarkably stable to the point that if a year of data were missing it could be interpolated by averaging the years before and after. There's really no exogenous change observed in the sample period--no instance of a state dramatically increasing or reducing its spending is mentioned--so the comparisons are mostly between rather than within states. This setup fails to provide evidence for the authors' claims such as, "a one percent increase in public mental health expenditures per capita would reduce the incidence of suicide among that group by 0.91 per 100,000 women in this age group [25-64]." On the positive side, it is nice to see a null finding published in a journal. Findings that are "qualitatively small lacking statistical significance" are not often seen in print even when they are justified. I only wonder in this case whether the findings will hold up. *Yes, the same could be said of much social science. That doesn't make it OK, nor does it mean that NSF Political Science should be defunded.